A newspaper article from 1863, touching on the problems faced in developing Blackpool in an orderly fashion because the land was in the ownership of various people. This is followed by a review of the plans of the Blackpool Land, Building & Hotel Company which developed a large area of land to the north of Blackpool (between Fumblers Hill and the Gynn). 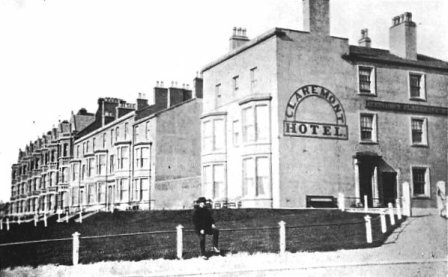 Known as the Claremont Park, it was an estate of high-class houses and hotels. Blackpool can scarcely be said to possess a history ; like its neighbour Fleetwood, it is the scene of some important events and is associated with some interesting traditions, but neither Blackpool nor Fleetwood is the name of a township, and neither name is on a map of Lancashire above half a century old. Indeed, until the commencement of the present century, Blackpool was little more than a collection of fishermen's huts, one or two of the most commodious or the cleanest occasionally affording- lodgings to invalids attracted thither by the &me of the health restoring air of the coast, and who chose to brave the uneasy locomotion which in those days brought the visitor to Blackpool. 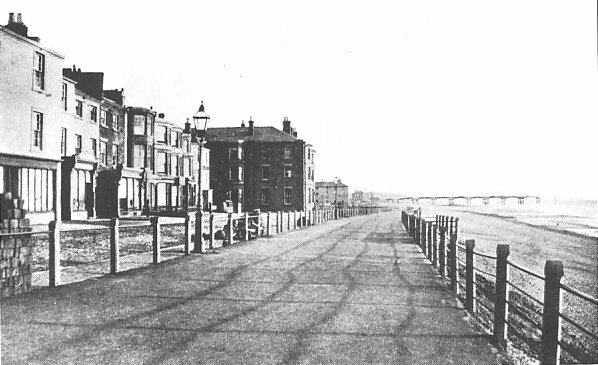 Central Promenade (near Church Street), Blackpool c1867. The town had evolved over the past hundred years with piecemeal development by various landowners. Without any planning there was no unifomity in buildings, building line or streets. In time the fame of the place extended, and as the population and-the wealth of Lancashire increased, Blackpool found its visitors increase. To meet the demand for accommodation during the summer season, houses of a better character were erected, and in time inns of a humble character, and ultimately hotels providing first class accommodation rose on the coast. Coaches then began to ply between Blackpool and the large towns of Lancashire and Yorkshire, and at last a railway connected the place with the rest of England. Elegant mansions have since risen in every direction, and it is only in a few odd corners that we see any traces of the low, mud built, thatched dwellings which were the temporary homes of visitors to the place during even modern memory. There are few visitors to Blackpool but must have seen great changes within the last few years. Its first church was only erected in 1821, yet it now boasts of three churches of the establishment, a Roman Catholic Church, of elegant design ; an Independent, a Baptist, and a Wesleyan chapel, and numerous and prosperous Sunday and other schools. 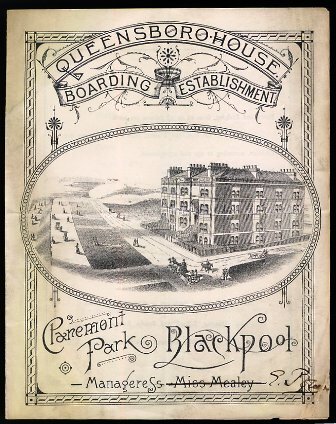 Having noticed Blackpool, past and present, we turn to its future, as likely to be developed by the Land and Hotel Company, whose operations will extend the town along the shore to the Gynn Road, and eastward towards Warbreck. This company has made purchases of land altogether to the extent of above fifty acres, the principal portion consisting of the Hill Farm Estate. 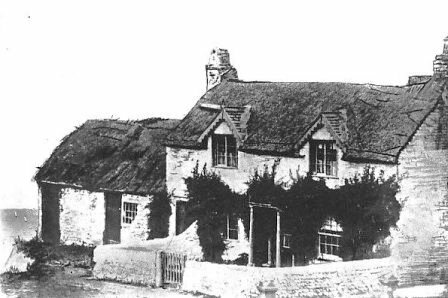 To those of our readers not conversant with the locality, we may state that the Hill Farm-house is situate about two-thirds the distance from the last erected houses at the north end of Blackpool, and the inn known as The Gynn. The land forming this estate resembles in shape a, boot, the leg portion representing the land stretching along the shore ; some fields stretching out eastward, indicate the foot, a deep heel representing the extreme north and west extremities of the estate, which is bounded on the north by the road leading from the Gynn Inn to the shore. Though Blackpool possesses advantages over Lytham in the bracing properties of its sea breezes, yet it compares unfavourably with the latter as regards want of uniformity in the houses facing the sea. Besides the fact of old and low buildings being mixed up together, as is the case in the houses facing the sea at Blackpool, it is impossible to secure anything like uniformity in frontage or elevation of buildings, where the land is in the ownership of various persons. This difficulty will be got over in the land for extension of the town northwards being under one management, that of the Land and Hotel Company. Again, at Lytham, care has been taken to secure good wide roads and promenades. This is another feature which the Land Company will carry out at Blackpool, and in which we hope that they will secure the co-operation of the owners of land, in order to give the public that which the company are wishful to do the greatest possible accommodation for public promenades and for carriage drives. We have been favoured with an inspection of the ground-plan, showing the mode in which it is proposed to lay out the large estate, beonging to the Land and Hotel Company, and we were forcibly struck with the immense advantages proposed to be given to the public in the shape of promenades and carriage-drives. If the plans of the company can be successfully-carried out, which we have little doubt will be the case, Blackpool will then stand successful comparison with any watering in England. Some may be ready to observe that the company has been got up as a joint-stock speculation. Whatever may be its results to the shareholders, to the public it cannot fail to be of advantage, from the large and comprehensive character of their undertaking. We will now proceed to give an idea of the way in which the company's land is to be laid out. After passing Bailey's (late Rossall's) Hotel, we come upon a short length of promenade, edged with a strip of grassy sward. At the north end of this length of promenade, we reach three cottages with an outbuilding, the gable of which is tottering upon the edge of the precipitous cliff. Here the operations of the Land and Hotel Company commence. On the site of this cottage, will be erected lodge-gates, which will open into a carriage drive continued along the shore to the Gynn-road. It is proposed that this road--which will be in front of all the buildings to be erected, and a short distance inland from the present edge of cliff, shall be not less than sixty feet wide, including carriage drive and promenades on each side. We have said that this road will run some distance east of the present edge of the cliff, and we must here explain the gigantic scale on which it is proposed to deal with the cliffs. In place of the very broken and irregular frontage they now present, a uniform line will be maintained, except at one part where it will expand out in a semi-circular mound : this will be opposite where it is proposed to erect the splendid new hotel. The projection at that point was necessary, in order that the approaches might be had direct from the hotel to the shore which will be secured by easy slopes from the north and south sides of the mound, on which will be formed a carriage road and foot walk. The cliffs will also be made to slope more gradually than at present, and about half way from the beach to the summit will be formed a promenade open to the public, of no less than five yards wide, and this will commence from the lodge at the site already pointed out, and be carried out all the way to the Gynn Road. This fine promenade, 1,200 yards in length, is one of the acquisitions which the Land and Hotel Company will afford to the public. For a distance below this promenade the slope will be covered with grass sward, and below that it will be hulked, as a necessary protection of the base of the slope against the encroachments of the sea. The rest of the slope above this promenade will also be a grassy sward, and on the top of the slope in its new formation, will run the very wide road we have already spoken of. Having endeavoured to give some idea of the future formation of the cliffs and the esplanade on the top of them, also the public promenade on the lower level, with the grassy slopes above and below it, we proceed to notice the plan of the projected buildings. Just beyond the cottages to which we have alluded, and facing the sea, is a row of newly-erected houses, to be called " Carlton Terrace. " Beyond these, and before we reach the Claremont Hotel, is a piece of land at present uncultivated. Here will be a crescent or terrace of houses facing the shore, and a terrace to face the road to Warbreck. 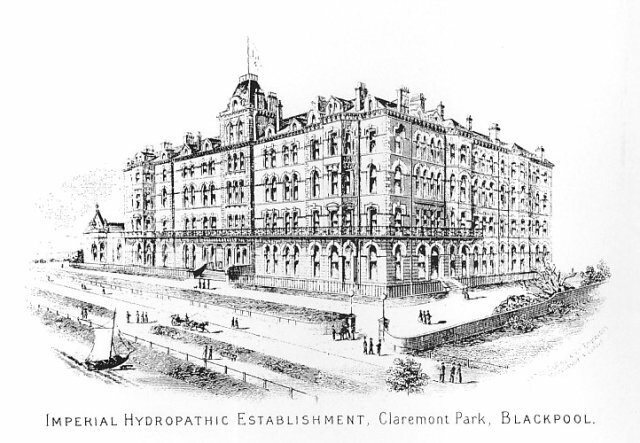 Claremont Hotel, which has been purchased by the Company, will be converted to private dwellings, and in front of them will be a plot of ground laid out in an ornamental manner. 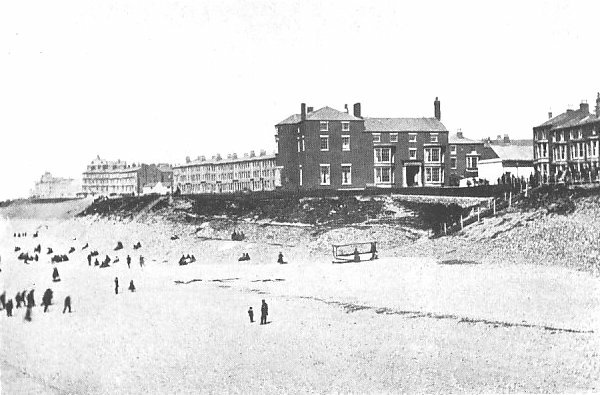 We next come to a row of recently erected houses ; immediately beyond this terrace begins the extensive fields constituting the unbuilt estate of the Land and Hotel Company, their sea frontage from this point being between 800 and 900 yards, The first erection is to be one of some extent, and is to include Public Baths and Assembly Rooms. In front of these will be a cross road, branching from the sixty-feet road before spoken of, and the road leading to Warbreck. And we may here remark that the Company, in that portion of the Warbreck road which runs through their own land, intend to widen it to the extent of about twelve feet. Indeed their plan includes a widening of the road to Warbreck throughout its entire length, but whether or not they will be able to carry out this desirable improvement will depend upon the owners of some of the adjoining land at the south end of the road and the local commissioners. We hope, however, that no selfish feeling will step in to stop a public improvement, towards the accomplishment of which the Land Company are so liberally disposed. The present road to Warbreck, at a point just beyond the Hill Farm House; will be diverted a little towards the east, for the better laying out of the land for buildings. It will also run in a straight line, in Place taking a sharp turn to the east which it does at present down the short, steep length at its terminus. The new road to Warbreck will join the one which at present runs from the shore past the Gynn Inn, at a point just beyond that hostelry. Reverting to the plan for the buildings fronting the shore, the next erection beyond the Baths and Assembly Room will he the large hotel which the company intend erecting. This establishment will be of a size and style commensurate with not only the present demand for superior hotel accommodation, but with the wants which the improvement and development of Blackpool, by the opening out of new roads and eligible building land, is expected to create. The land set apart for this hotel and grounds is about four acres attached to the hotel will be promenades; archery and croquet grounds, covered buildings for recreation in unfavourable weather, bowling green, stables, &c.
Beyond the hotel, to the northern boundary of the estate, which is the road from the Gynn to the shore, the land is laid out for the erection of terraces of houses, also for detached and semidetached residences. Two or more wide crossroads will be formed in this length, connecting the sixty feet road with the new road to Warbreck. We stated at the outset that the Company's land resembled a boot in shape ; up to this we have been describing that portion which forms the leg ; now we must deal with the portion which represents the foot, the toe pointing directly east. This portion includes about twenty acres, and though the whole plan of the estate presents a park-like appearance, yet this portion does so more strikingly than the rest, the oval centre of the large plot being set out for ornamental grounds and promenades. This plot of land is bounded north, south, and east by the lands of other proprietors. From the new Warbreck road will branch off directly eastward, two wide roads which encircle the ornamental grounds in the centre of this plan of the estate. Fronting these two roads, and looking into the ornamental grounds in the centre, will be erected semi-detached residences. We have now travelled over the whole of the land and Hotel Company's estate, and have only to add that in some part of it most convenient for the largest number of future residents of what might properly be styled " Blackpool Park," or not inaptly named "New Blackpool," a plot will be set apart for the erection of a Church and Parsonage House. The only buildings which the Company at present propose to erect are the Hotel, and the assembly Room and Baths, all the rest of the estate being set apart for sale.